Our Mini-Skool Cawthra family welcomes the opportunity to meet you and your family and learn how we can best meet your childcare needs. We provide family childcare services in a purpose-built building with several playgrounds that are newly renovated and designed to meet the needs and interests of specific age groups. We also have an indoor gym for programmed motor activities. All aspects of early childhood development are encouraged through hands-on activities. Activities based on children’s interest is the most important piece of our enhanced programs. Our Three-Year-Old Program encourages children to learn about letters of the alphabet and their sounds through the use of the Jolly Phonics system. This aspect of learning is incorporated seamlessly into the daily activities. We offer full-day childcare for infants, toddlers and preschoolers. Our variety of programs work well to sustain engagement and encourage children’s expressions. For families who are moving or wish to help friends and family find the Mini-Skool center nearest to them, Mini-Skool’s school finder is a fast and easy way to find the closest Mini-Skool center. We believe that communication between you and your child’s teacher is extremely valuable. You will always have daily interaction with the teachers. Twice a year we conduct a Parent/ Teacher night where we discuss your child’s progress and development. Thank you for your interest in the Cawthra Rd. Mini-Skool Childcare Centre in Mississauga. We understand that choosing the right childcare centre is a delicate and detailed decision, and we hope the information here on our website is helpful in making your decision. 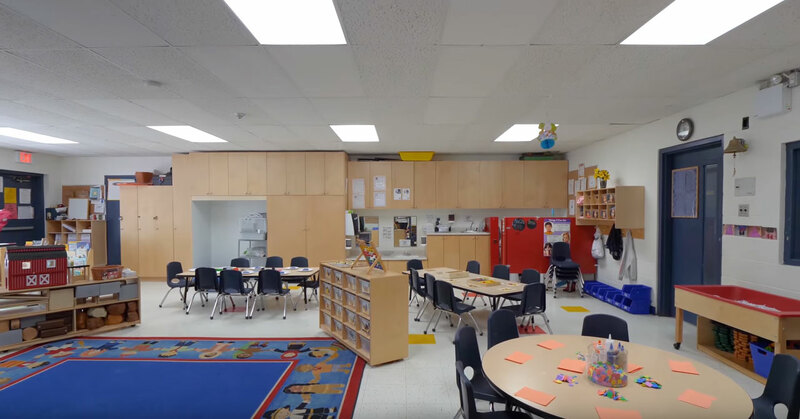 Please feel free to contact us at 905-276-3933 to arrange a tour of our Childcare Centre in Mississauga, or if you have any questions that we can help with. ”Our kids feel at home here. We, as parents feel at home here. We always have.